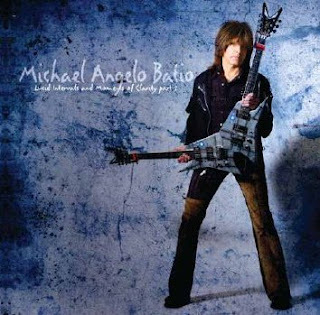 Michael Angelo Batio is an American shred guitarist, currently consists of five studio albums, two compilation albums, one cover album and seven videos. Before beginning his career as a solo artist, Batio was the guitarist for Holland (1984–1986), Jim Gillette (1987) and Nitro (1987–1993). Holland released one studio album and one compilation album, Gillette released one studio album before forming Nitro who released two studio albums and one compilation album. Batio began his solo career in 1993 after the breakup of Nitro, and released his debut album, No Boundaries, in 1995. Holiday Strings was released in 1996 before MAB's second studio album was released in the form of Planet Gemini in 1997. Tradition was released in 1999, followed by Lucid Intervals and Moments of Clarity in 2000. In 2000, Batio set up a project under the name of C4. The band released one album, Call to Arms in 2001. Angelo's first compilation was released in 2004; Lucid Intervals and Moments of Clarity Part 2 comprised songs from Tradition and Lucid Intervals. A fifth studio album was released in 2005 entitled Hands Without Shadows, which features tributes and covers as well as MAB's own compositions. The guitarist also played bass on Katrina Johansson's debut EP, Guitarsongs Volume 1, in 2005. Batio's first two studio albums were remixed and remastered with additional drums from Joe Babiak in 2007 for the compilation release 2 X Again.